Rotterdam Concert Canceled After Terror Plot Warning : The Two-Way Dutch police canceled a concert by the Los Angeles band Allah-Las after a tip from Spanish authorities about the possibility of an attack at the venue. Two men have been arrested. A van registered in Spain sits near the concert venue Maassilo in Rotterdam, Netherlands, where a rock concert set for Wednesday night was canceled because of a terror threat. The driver of the van, which contained some gas bottles, was arrested. A concert in Rotterdam was canceled after Dutch police received a tip about a possible terror plot at the venue. The American garage rock band Allah-Las was scheduled to perform on Wednesday night, but the event was called off after a warning from Spanish authorities led to the arrest of two men who officials suspected might be planning an attack, according to NPR's Soraya Sarhaddi Nelson. 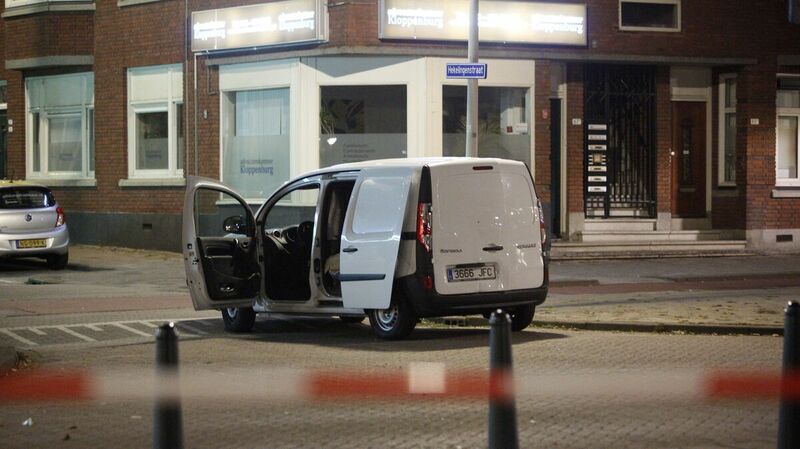 "Dutch police say they contained the driver of a Spanish-registered van carrying some gas bottles near the venue where the Los Angeles band the Allah-Las was scheduled to play. "Officials say it's unclear at this point whether the man, who says he is a mechanic and was intoxicated at the time of his arrest, was involved in any plot. Investigators say he had a logical explanation for why he had the gas bottles in his van. A search of his home turned up no evidence. "Dutch broadcaster NOS reported police also arrested a second man, who is 22 [years old], at his home in the southern Netherlands in connection with the alleged plot." There is no apparent connection between the warning and the terrorist attacks last week in Spain. Dutch police said the man driving the van was arrested around 9:30 p.m. local time, just two hours after the Dutch police received the alert from Spanish law enforcement, according to broadcaster Deutsche Welle. "There was concrete information from the Spanish police that an attack would be committed on that date, at this place and against this rock band," Rotterdam's police chief, Frank Paauw, told the German broadcaster. "The information about the threat was so specific on the location of the event that with that arrest, we can conclude that the threat is gone." About 1,000 people had been expected at Maassilo, the venue where the concert was scheduled to take place, according to Deutsche Welle. The New York Times reported that police transported members of Allah-Las away from the venue when the event was canceled. In an email to NPR, a spokesperson for the Allah-Las' record label, Mexican Summer, confirmed that a possible terror threat had led to the canceled event, adding, "The band is unharmed and are very grateful to the Rotterdam Police and other responsible agencies for detecting the potential threat before anyone was hurt." The band is scheduled to perform in Warsaw, Poland, on Thursday.